While the Samsung Gear VR (2017) isn't a massive step forward for mobile VR, it is easily one of the most polished mobile VR solutions currently on the market. If you own or plan to buy a modern Samsung flagship and have even a faint interest in VR, this is really a no-brainer. Samsung Gear VR continues to be the dominant force in the virtual reality space – far eclipsing its closest competitors. Even with the launch of the Google Daydream View headset, which added a brand new wireless controller into the mix, Samsung’s VR headset still seemed unchallenged. Of course, the backing of Oculus surely helps in keeping things fresh by having a revolving door of new content, but things are only going to get better with the latest iteration of the headset. The 2017 edition of the Samsung Gear VR traverses the same path as its closest rival by introducing a wireless remote which is bundled with the headset. It certainly functions and behaves similarly to the wireless remote with the Google Daydream View, but Samsung’s interpretation is different. While this’ll no doubt introduce some new interactions for users in the VR space, the question that remains is whether or not it’s going to be enough to propel mobile VR to the next level. That’s exactly what we aim to find out in this full Samsung Gear VR (2017) review. Staying faithful to the design language of its predecessors, this year’s Gear VR doesn’t see any radical aesthetic changes –it still has that sci-fi look with its all plastic design. Just as we saw with the Gear VR that debuted alongside the unfortunate Note 7 back in the fall, Samsung has opted to employ darker colors with its paint job but otherwise it follows in similar fashion to previous Gear VR headsets. However, there is one small but significant change in the design that makes it look somewhat “unfinished” when it’s used. Samsung has removed the translucent covering that goes over the handset, which was designed to shield ambient light from bleeding into the headset while also doubling as a protective layer for the phone. There is a plastic cover that goes over the headset, but it’s only applicable when there’s no phone being accommodated by the headset. It’s a strange decision honestly, mainly because the design looks rather unfinished with the phone being a glaring distraction right there. Besides that, we’re pretty much familiar with everything else. Inserting the phone, a Galaxy S8 in our case, is done by lining its USB Type-C port with the slot, so that it’s properly fastened and secured down. Even though we didn’t once experience any mishaps with the S8 accidentally becoming undone, that missing protective shield now makes us feel a bit more guarded – so it’s something that’s always in the back of our mind when using the headset. When it comes to comfort, we really have no complaints about its fit. However, we really recommend using the second strap going over the head, in addition to the usual one that wraps around, just so that it helps to support the headset from drooping too much. Meanwhile, the padded material lining the inside of the headset is helpful in keeping the Gear VR snug. It is also worth noting that this material is held together with velcro, making it a cinch to replace if it becomes worn, faded, or just plain gross from sweat. There’s a turning wheel on top of the headset that’s used to adjust the distance between the phone and display lenses, while the touchpad, volume controls, home, and back buttons are found on the right side of the Gear VR. On the underside, there’s a USB Type-C port on hand to keep a steady stream of juice flowing to the phone while it’s being used. Naturally, the star of the show here is the new companion controller. Compared to Google Daydream View’s controller, I have to say I felt the design here was better arranged overall. First and foremost, there’s an actual trigger button on its one end, making it feel more natural when it comes to firing off weapons in a game. It’s supplemented by the touch sensitive pad, which offers additional functionality, but it also acts as another button when it’s pressed down. Even though both the aesthetics and ergonomics of the Gear VR’s controller are superior than that of the Google Daydream View controller, one downside is that Samsung has elected to use 2 AAA batteries instead of a rechargeable one like you’d find in the Daydream View. It’s also unfortunate that they didn’t have a better implementation when it comes to storing or tucking away the controller when it’s not being used. 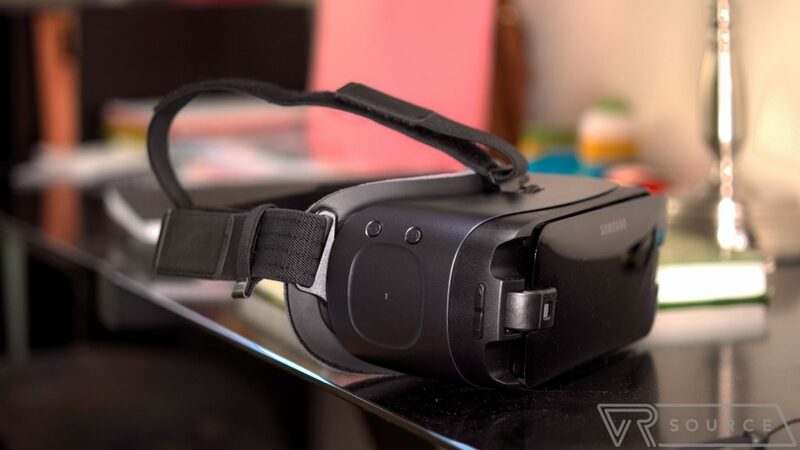 Unlike the Daydream View’s ability to store its controller inside of the headset, making it unobstructive, the controller for the Gear VR is simply left to dangle in this makeshift slot around one of its straps. 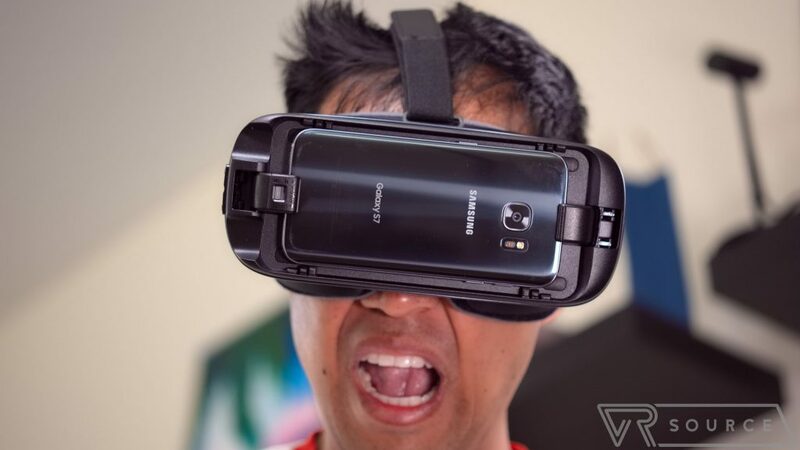 Interestingly enough, the Samsung Gear VR supports all of Sammy’s flagship phones going far back as the S6 line. That’s because it comes with another adapter with a microUSB connection to accommodate those phones, ensuring that customers with older phones aren’t left out of the mix. 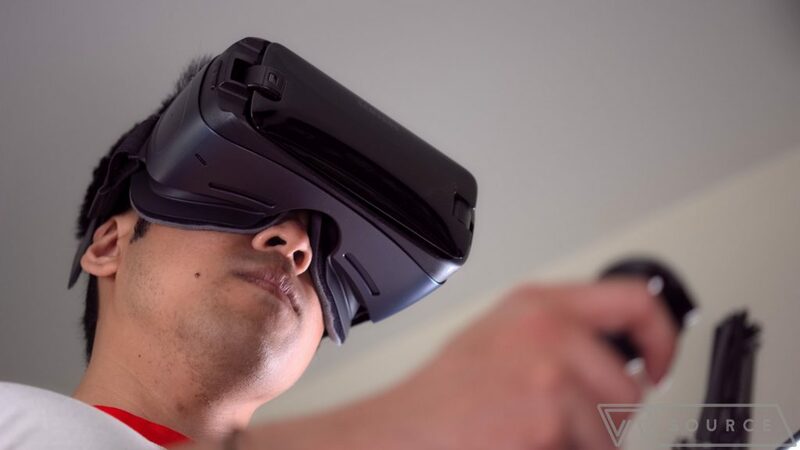 Once the phone is correctly positioned into place within the headset, the Oculus Gear VR app automatically launches and guides us to connecting the controller. Once paired and given a brief tutorial on how to use the controller, we’re then transported to the Oculus Home interface – where we can view all of our downloaded content and purchase additional ones. Using the Galaxy S8, the display lenses allow for 101-degrees of viewing, so it doesn’t ever make it feel narrow to the point that we feel confined. However, there’s just a smidgen of light bleeding towards the top of the headset, but it’s soft enough to not become too distracting. Regardless, the high resolution of the S8’s Super AMOLED display delivers crisp and detailed visuals in the few experiences we checked out. You will, however, need to ensure that the resolution of the S8’s display is set to WQHD+ (2960 x 1440) in order to get the best visual detail possible. Honestly, there’s not too much of a dramatic change to the overall VR experience than what was found with older iterations of the Gear VR. What you’ll find here is pretty much the same mobile VR experience, wherein it’s still a sit down, look around kind of experience. It’s exactly the same recipe with other mobile VR headsets, allowing us to absorb and look around in this virtual world. In other words, don’t expect spatial tracking for stuff like leaning, standing up, etc — which for now is something you can only find with PC-based headsets or the Playstation VR. Still, the addition of a controller does make the experience here at least a tad bit sweeter than what Samsung offered before. Overall, though, it functions in the same capacity as the Google Daydream View’s controller – with the exception of how its trigger elicits a more natural response with certain functions. For example, firing off a weapon in a first person shooter feels more natural with this controller, as we’re using our index finger to pull the trigger. It works just as expected, while also lending some variation to the usual VR experience. 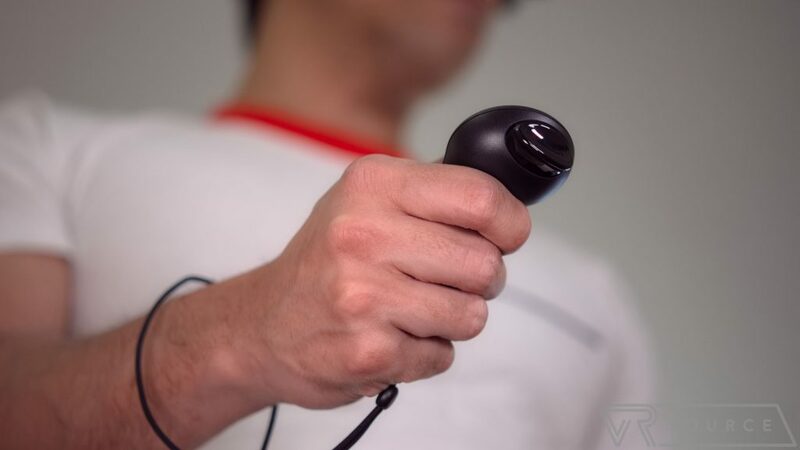 And this is crucial because it helps to provide some interaction in the VR world with our hand, rather than relying on just head movements or tapping on the touchpad on the headset. So far, it’s proven to be responsive in dealing with all of the heavy movement and action we’ve checked out. Still, it’s tethered in the way that the controller can’t be tracked independently in space. In fact, if you’re right handed, the controller is usually isolated to the bottom right corner of the display area – and alternatively, on the left if you’re left handed. 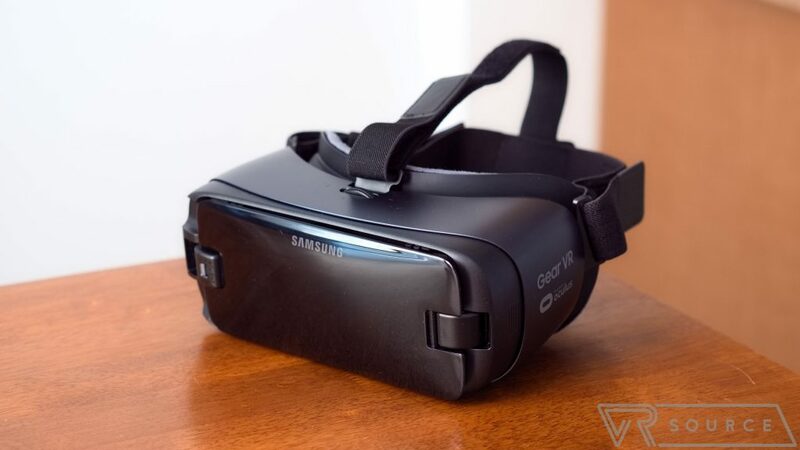 As much as the controller will help to enhance the mobile VR experience from what it was before, the Samsung Gear VR still has a long way to go to match the kind of immersion we get from more expensive PC or console powered VR systems. On a mobile level, there’s not a whole lot to complain about, since it performs smoothly and the controller helps to add is some new interaction. Similar to the Google Daydream View, the Samsung Gear VR only has a handful of apps/experiences that support the new controller. It’s slim pickings for now, but that can very well change week-by-week, especially knowing that it has the backing of Oculus. That alone has been crucial, just because the Samsung Gear VR continues to contain some of the best and most diverse content for mobile VR. In a short amount of time, we will likely see some new content that truly leverages the power of the controller. We have no doubt that’ll happen, even more when the Gear VR has the largest user base out there. 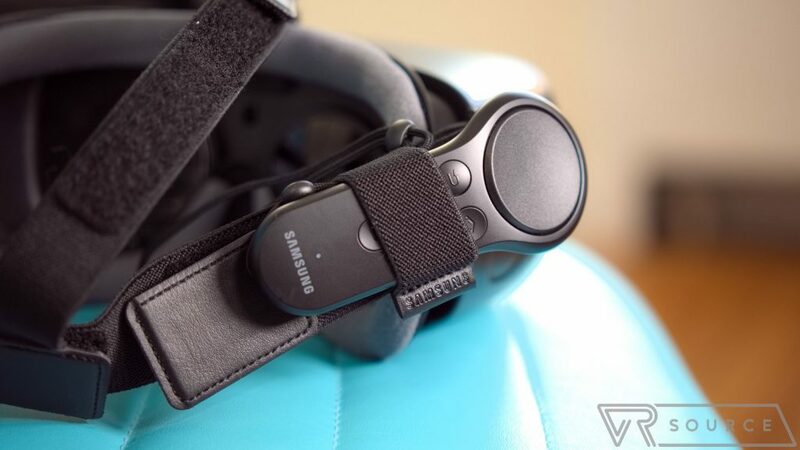 It’s also worth noting that you can always use the built-in gamepad or a 3rd party controller to play the rest of the older Gear VR games, you just won’t be able to use the motion controller. When it launches on April 21, the 2017 edition of the Samsung Gear VR will fetch for $130, which is a steep cost in comparison to the $79 Google Daydream View. That cost does include the new controller and batteries, which is a small consolation for some. It is also important to note that you can buy just the controller for $40 in order to pair it with an earlier version of the Gear VR. This is a great move on Samsung’s part, as it doesn’t force consumers to buy new models unless they want to. Being honest, the new lineup of games and experiences that support the motion controller make for slim pickings. Despite that, we do prefer how the new controller offers superior ergonomics and functionality over its rival, and in a short span of time, developers will harness the power of the controller to deliver top-notch content. This is where the Gear VR excels and shines over its competitors! In its current iteration, the Samsung Gear VR offers consumers the richest mobile VR experience out there thanks to a large library of older Gear VR games and an extremely polished motion controller for new experiences. The addition of the controller is a logical decision by Samsung, one that’s a small step forward in helping to enhance the mobile VR experience, but it’s not something we’d proclaim as being dramatic or game changing at the moment. But hey, don’t let that dissuade you, since it’s just limitations with the technology that prevents mobile VR from really taking that giant leap. At the end of the day, the Gear VR continues to be a great platform for those that don’t want to invest in more expensive VR solutions but are looking for something a bit more immersive than you’d get with platforms like Google Cardboard.